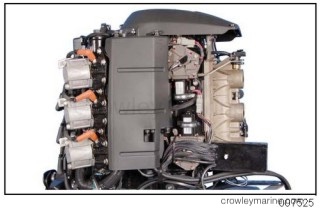 Use this instruction sheet when installing or replacing the Evinrude ICON shift actuator on 2008 and newer 200 – 300 HP 90° V6 (3.3 L and 3.4 L) Evinrude E-TEC® outboards, equipped with the Evinrude ICON System. 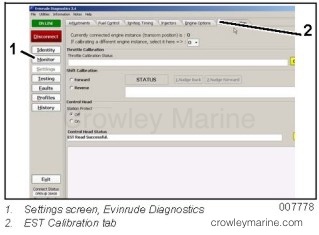 Use Evinrude Diagnostics software, version 4.0 or higher, to calibrate the actuators for correct throttle and shift stroke. 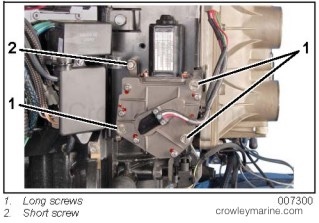 Failure to correctly calibrate Evinrude ICON shift actuators can cause engine shift systems failures not covered by the outboard’s warranty and can result in loss of boat control. NOTICE: Always disconnect the negative (–) cable first to avoid damaging the electrical system of the engine. Observe and note all wire routings before disassembling. 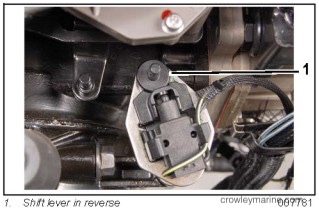 Remove the shift actuator connector from the clip on the mounting plate. Disconnect the shift actuator harness. Remove the clamp retaining screw. 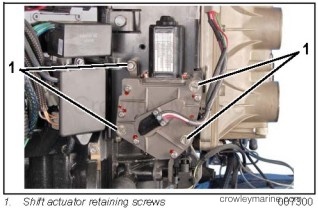 Remove the four shift actuator retaining screws. 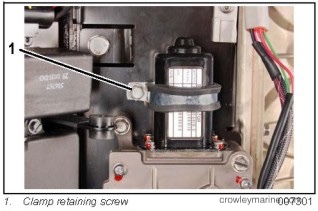 Remove old adhesive from clamp retaining screw and shift actuator retaining screws. 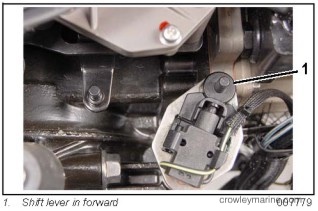 Apply Nut Lock on the threads of the shift actuator retaining screws. 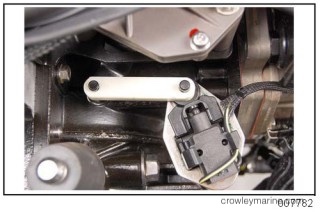 Install shift actuator on mounting plate with three long screws and one short screw. Tighten screws to a torque of 60 to 84 in. lbs. (7 to 9.5 Nm). 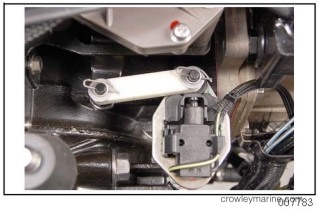 Place clamp over actuator motor. Apply Nut Lock on the threads of the clamp retaining screw. 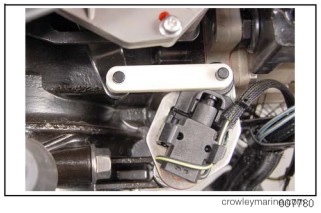 Install and tighten screw to a torque of 60 to 84 in. lbs. (7 to 9.5 Nm). Connect the shift actuator harness. Attach to clip on mounting plate. 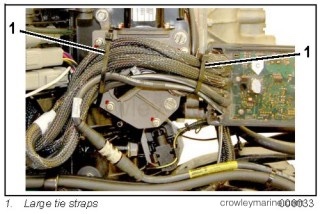 Secure shift actuator harness with tie strap, P/N 317893. 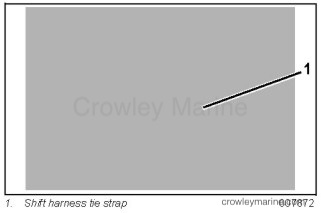 Route all ESM harnesses as shown and secure to shift actuator with large two tie straps, P/N 907833, as shown. Connect battery cables to the battery. 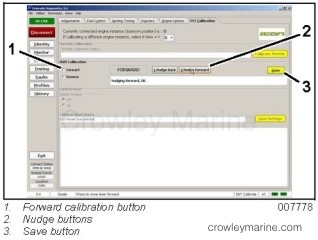 Use the EST Calibration tab of the Evinrude Diagnostics “Settings” screen to calibrate the shift actuator stroke. In a multi-engine application, all outboards can be calibrated through one connection by changing the engine instance setting on the screen. With the shift link disconnected, rotate the propeller and manually shift the outboard into forward gear with the shift lever. IMPORTANT: Make sure the gear is fully engaged and the lever is all the way forward. Click the Forward button under Shift Calibration on the EST Calibration screen. The actuator arm will move forward. Use the Nudge buttons to move the actuator arm forward or backward until the shift link aligns with the actuator arm and shift lever pins. When the link and pins are exactly aligned, install the link and click the Save button. The actuator will move to the neutral position. With the shift link disconnected, rotate the propeller and manually shift the outboard into reverse gear with the shift lever. IMPORTANT: Make sure the gear is fully engaged and the lever is all the way to the rear. Click the Reverse button under Shift Calibration on the EST Calibration screen. 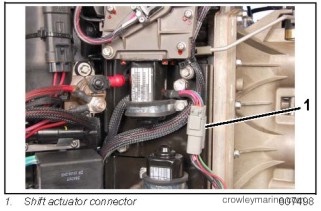 The actuator arm will move backward. Use the Nudge buttons to align the shift link. After forward and reverse strokes have been calibrated, install the shift link and secure with retainer clips and washers. Lock the retainers by moving the angled section behind the straight section. NOTICE: When installation is complete, shift the outboard with control (while rotating propeller). Rotate the propeller shaft back and forth to ensure the face of the clutch dog contacts the gear in both forward and reverse. With the outboard in neutral, make sure the propeller shaft turns freely with no contact between the clutch dog and gears.